Cafoscarina 3, 3224 Dorsoduro, Campo dei Arras, Near Ca Foscari. 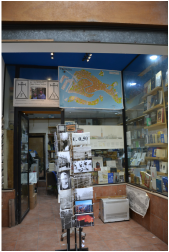 Cafoscarina 3 is the fiction and foreign language bookstore for the students of Venice' famous Ca Foscari University. It stands to reason, and it is absolutely true, that they have the largest, most diverse and best selection of English language and foreign language books of any book store in Venice. The general public is welcome to shop in the Cafoscarina bookstores. Here you will find a broad range of fiction in English and other foreign languages including modern and contemporary fiction, classics, books about Venice (naturally), award winning titles and even some recent publications. Must know shop for any reader on a long trip or a long stay away home! 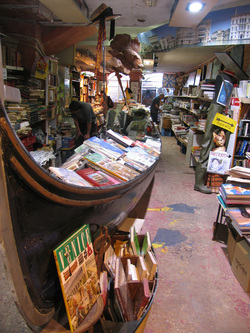 Mare di Carta, International Bookstore, Santa Croce 222 on Fondamenta dei Tolentini near Piazzale Roma. Nautical books, papers and editorials in the perfect city for words about such things. Mare di Carta, Sea of Paper, specializes in books about all things to do with the sea, sea creatures and seafaring peoples, but also has a wide selection of books on other subjects. They've also got books in many languages and hard-to-find items. Libreria Acqua Alta, 5176 Castello, On Calle Lunga Santa Maria Formosa. Libreria Acqua Alta, “The Most Beautiful Bookstore in the World”, by any other name would be just as beautiful. They've got an entrance off their own tiny campo and a back room that opens out on a dock along a small canal. The inventory includes books in several languages, many antiques and collectors items as well as a collection of bric-a-brac ranging from practical to humorous. This place is a book-lovers paradise. Libreria Toletta, 1214 Dorsoduro, On Calle Della Toletta. 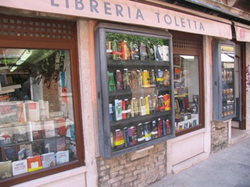 Libreria Toletta is the largest bookstore in Venice, with three storefronts along the Calle Della Toletta. The shops are divided by subject matter and genre of books. Although this shop serves primarily the local and student populations of Venice, it does have a selection of books in English and some languages other than Italian. Libreria Editrice Filippi di Franco Filippi, 5284 Castello, Ramo Casellaria.